Happy Monday everyone! I hope you all had a great weekend. :) I got a good chunk of swatching done over the weekend, so hopefully I will have some earlier posting for this week. :) Today I have some new colors from Initial Lacquer and I'm hoping to have enough time to post the last 2 polish from my Sally Hansen Fuzzy Coat post. Pink Lemonade has a neon "crelly" base with small and micro purple glitter. All nails are 2 coats with top coat. My camera was a brat when picking up the pink base color for Pink Lemonade. :/ It's a lighter neon pink than my camera wanted to show. Nevertheless, this color is awesome! I've seen a lot of polish with black glitter in colored bases lately and this is a fun way to mix it up! The purple glitters aren't too dark that the appear black, they definently show up purple and I love purple! ;) Formula was perfect; no fishing for glitter and it dried quickly. It does dry with a semi-matte finish, so I opted for a top coat, but you don't have to. Something Complicated contains various shapes, sizes and colors of holographic glitter in a black jelly base. I used 2 coats of Something Complicated with top coat. Something Complicated contains more of those awesome holographic glitters Initial Lacquer has used in previous polishes that I love so much! The black jelly base isn't too dark that it hides any of the glitters and they all pop out nicely. Formula was again great! It does dry a bit "rough" so to smooth it out I would say go with a top coat. Something Simple is a white shimmer base with grey, silver, holo and iridescent glitters. For these swatches I used 3 coats with top coat. Strawberry Festival has a pale pink base with neon pink, aqua, gray and silver glitters. All nails are 2 coats with top coat. Another beautiful, delicate polish! There is a bit of frost to the base, though it's not overly powerful and I couldn't even get my camera to pick it up but it is there. ;) The color does remind me of strawberries! I've never been to strawberry festival, so I can't comment on that. :P Formula was great, but similar to Something Simple I did need to fish for the larger pink neon hexes. Again I think they are meant as an accent though. Sunflower Garden contains neon blue, neon pink,navy blue and white glitters in a yellow jelly base. I used 3 coats with top coat. 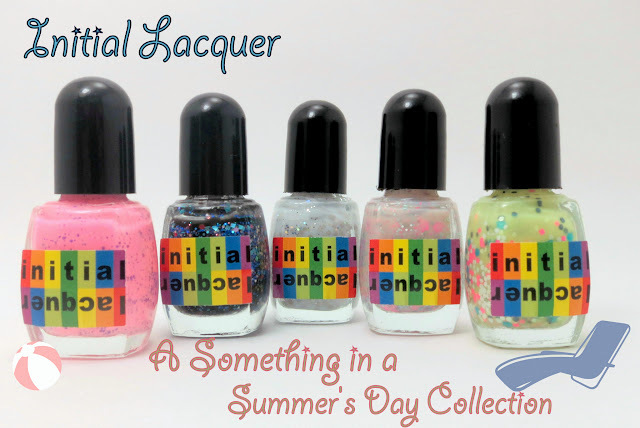 Initial Lacquer's new summer collection will be released this Friday, June 7th along with 2 other polishes, in her Etsy store. Make sure to follow Initial Lacquer on Facebook and Tumblr for restock time and to check out new colors (she's already posted 1 of the 2 newly added polishes to this collection, hopefully she will post the others soon. ;) ).